Many people feel they must get a young bunny when they choose a rabbit companion. This choice could be the wrong one. Myth: A young rabbit is easier to litter train. Truth: An adult, neutered or spayed rabbit is easier to litter train than a baby. Like a small child or puppy, a young rabbit has accidents and needs to be cleaned up after during training. When bunny reaches sexual maturity (3-6) months), s/he may begin spraying and appear to lose all the litterbox training you worked so hard to achieve. At that point, get a veterinarian referral from House Rabbit Society and have your rabbit neutered or spayed. See quiz about litterbox training baby bunnies here . Myth: My child needs a baby bunny so they can grow up together. 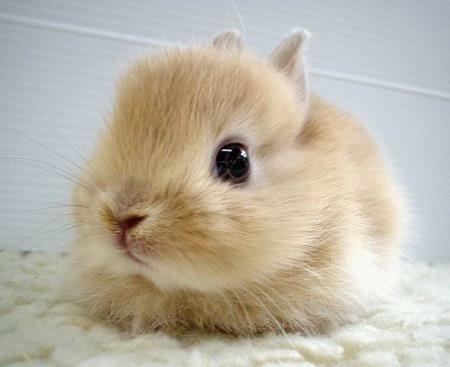 Truth: Your child won't know how to take care of a baby bunny and may hurt him. The rabbit is an adult's responsibility, no matter what age the child is. Rabbits are physically delicate animals and are a poor choice for a child under the age of five. If picked up, bunnies are not designed to be able to hold on. If the rabbit is an all-round family member and play with the bunny is supervised, then a child can grow up with a rabbit. A large, adult rabbit will command the most respect from a child. Myth: Baby bunnies are naturally docile. Truth: Baby rabbits are active, playful, and chew everything in sight. They are much more destructive than most adult rabbits. It's also hard to tell what personality the baby will have as an adult. Myth: Baby bunnies love to be held and mothered. Truth: Most baby bunnies are too busy dashing madly around the house, squeezing behind dressers, and chewing baseboards and rugs to be held for long. As bunny grows older, she'll settle down and will come sit by you and, possibly, like to be held. Of course, every rabbit, like every person, is different. These are general observations. So Who Should Get a Baby Rabbit? *understands that when bunny matures, there will need to be a neuter/spay appointment and isn’t fazed when cute baby sprays urine on the walls. S/he knows that neutering will stop the problem. Baby rabbits, like adults, need exercise and challenges and should not be kept in a cage all of the time.